The World Library of Mental Health celebrates the important contributions to mental health made by leading experts in their individual fields. Each author has compiled a career-long collection of what they consider to be their finest pieces: extracts from books, journals, articles, major theoretical and practical contributions, and salient research findings. 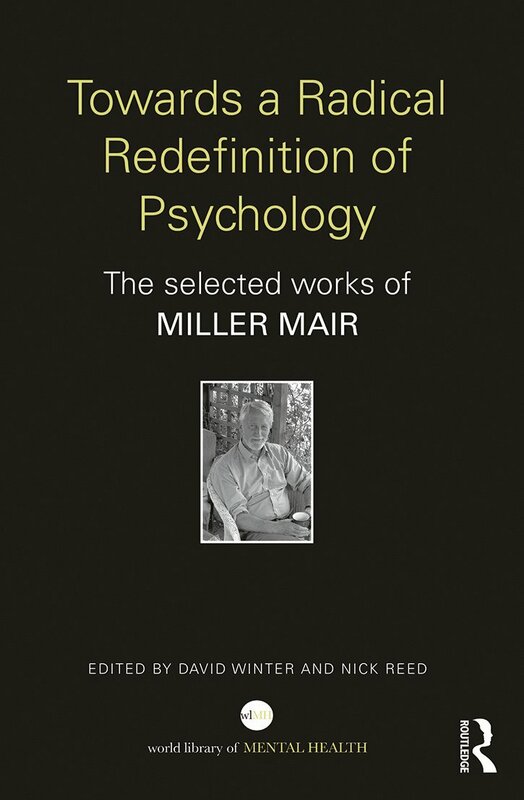 Miller Mair, clinical psychologist and psychotherapist, devoted his life to developing a psychology that provided a radical alternative to the behavioural, and latterly cognitive-behavioural, approaches that have dominated the field. He presented this work in a wide range of publications and conference papers, and prior to his untimely death in 2011 he had selected a number of these for a volume of his collected works. This book is based upon Miller’s selection, and includes several previously unpublished papers as well as others that are now out of print. Miller was considerably influenced by George Kelly’s personal construct psychology, as is apparent in most of his writings. However, his papers on psychology and psychotherapy also draw upon an extraordinarily wide range of other fields of knowledge, including imagery; metaphor; storytelling and narrative; rhetoric; discourse and conversation; poetry; and spirituality. These concerns are reflected in the contributions selected for this volume, which also demonstrate the variation in his style of writing from the more conventionally academic to the personal and poetic as he developed a ‘poetics of experience’ and a stance of ‘conversational inquiry’. Miller’s final publication was entitled ‘Enchanting psychology’, and it is hoped that this volume will provide an antidote to the disenchantment that many readers may feel with mechanistic and reductionist approaches in psychology and its clinical applications, and more generally in health service rhetoric and policies. As these writings vividly demonstrate, a clinical psychologist and psychotherapist can, and should, also be a poet, artist, and storyteller. The volume will be of value to readers previously unfamiliar with Miller’s ideas, but also to those who know his work, who will find here the first published selection of his papers. "The editors have done a wonderful job compiling the papers of one of the most brilliant psychologists of the last 50 years. It is must reading for anyone who believes psychology has lost its humanity and desires to see how it may find its way back to honoring the person. "- Larry M. Leitner, Ph.D., Professor Emeritus of Psychology, Miami University, Oxford, OH, USA. Preface. Part I: Knowing and Telling. The Long Quest to Know. Telling Psychological Tales. The Personal Venture. Part II: Rhetoric, Discourse, and Conversational Inquiry. Psychology as a Discipline of Discourse. Conversational Research and Clinical Practice. Psychologists are Human Too. Part III: Metaphors. Metaphors for Living. The Community of Self. Part IV: Psychotherapy and Story Telling. Stories we Live and Stories we Tell. Psychotherapy, Conversation and Story Telling. Part V: Understanding. A Long Term Quest for Understanding. Searching to Understand – On Being a Psychologist in a Changing World . Enchanting Psychology: The Poetry of Personal Inquiry. References. David Winter is Professor of Clinical Psychology and Programme Director of the Doctorate in Clinical Psychology at the University of Hertfordshire, UK. His publications include Personal Construct Psychology in Clinical Practice (Routledge, 1992). Nick Reed is Director of the Centre for Personal Construct Psychology, part of the Department of Psychology at the University of Hertfordshire, UK. For the first time ever, the work of each contributor is presented in a single volume so readers can follow the themes and progress of their work and identify the contributions made to, and the development of, the fields themselves.